Cheese is high in fat, calcium and protein. It's very healthy, but don't forget to consume it thoughtfully. The best way to eat cheese is to serve it on a cheese plate with pears, grapes, olives, tomatoes. White or red wine would be perfect as a drink. You can also add cheese to any other dish to improve its taste and flavor. Never serve cheese cold. Let is stand for about half an hour at room temperature. Warm cheese is more flavorful and its texture is much better. Invite your friends over for a cheese party to Celebrate National Cheese Day. 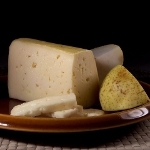 Serve several varieties of cheese on one plate. Soft, hard and blue cheeses would be perfect for one plate. Choose a bottle of wine, that will go well with cheeses and start a party.